Mt. Shasta draws visitors from all across Northern California as a gateway to world-class recreation, known worldwide for picturesque mountain terrain and excellent quality of life. A unique blend of friendly neighborhoods, attractive parks, fine restaurants and prosperous businesses make this well-rounded city the jewel of Siskiyou County. A population of 3600 maintains the “small-town” atmosphere that makes residing here so desirable. The streets are safe and clean, local businesses provide a stable financial base, and there is a great community spirit for all to enjoy. Located only an hour’s drive north of Redding, the City of Mt. 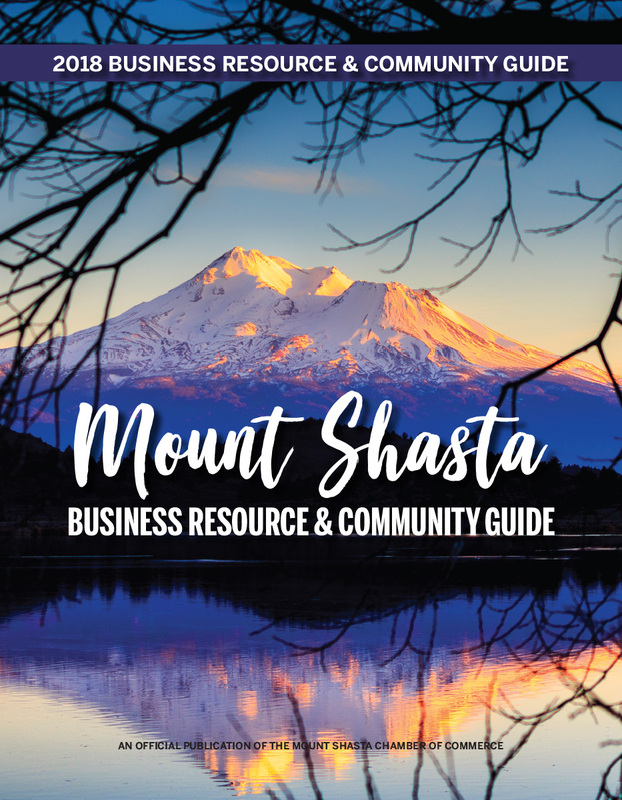 Shasta has easy access to the excitement and amenities of nine counties within the area, while retaining its own identity as the recreational and cultural hub of the Shasta Region. A town with pioneer beginnings, Mt. Shasta is a scenic getaway, artists’ colony, and tourism center. As a community, it’s vibrant and family-oriented with abundant outdoor recreation. With almost 26,000 visitors yearly, tourism is the major industry and largest contributor to local economy. The breathtaking scenery, delightfully different seasons, clean air and water, and unlimited recreational opportunities continue to attract people from all points of the compass. The City of Mt. Shasta is both 60 miles north of Redding and south of the Oregon border next to Interstate 5. Our valley is surrounded by pine-covered mountains with the snowy volcanic peak of Mount Shasta towering 14,162 feet high. The city limits is an area of 3.4 square miles, with an elevation of 3500 feet and sloping upwards. The sphere of influence extends about 41 square miles and is surrounded by the Shasta Trinity National Forest. With exceptional air quality and pure water in a high alpine environment, we enjoy four distinct seasons. The weather in the City of Mt. Shasta and Siskiyou County is ideal. Average summer afternoon temperatures are in the 80’s with no humidity, and evening temperatures may drop to the 40’s. Rain and snowfall occurs mainly in the months of October through mid-May. Much of Mt. Shasta City’s past is connected to the splendor of nature that characterizes the region. Water, in the forms of snow, pure springs and even log ponds, has played an important role in the area’s history. Several Native American tribes lived around Mount Shasta and many continue to hold ceremonies on the mountain, a part of their traditions for uncounted centuries. The snowy slopes drew the attention of Hudson Bay trappers in the late 1820’s who assigned several names to the peak. 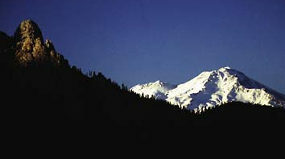 Among them, Peter Skeene Ogden gave it the name Sastise; however, it is uncertain whether he saw Mount Shasta or one of the Cascade Mountains in southern Oregon. 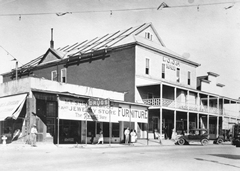 It was in the 1850’s that the area became home to a growing population of newcomers. Originally the town was called Strawberry Valley and boasted a stage stop, an inn and tavern, and a bucket and tub factory. When the community applied for a post office it was required to change its name, as there were too many “Strawberry Valleys” in California. Thus the alpine village took the name Berryvale. The railroad came to the community in 1886 with the support of one of the community’s founding members, Justin Hinckley Sisson. The new town site and railroad station was built on the land Sisson granted to the railroad company and the town was named Sisson. The town was to go through one last name change in 1924 when citizens voted by a narrow margin to rename the town Mt. Shasta. Prior to the arrival of the railroad, the clean water and mountain air drew people for summer vacations. 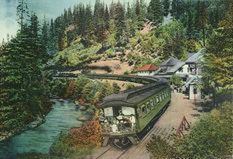 With the railroad bringing visitors from the heat-blasted southlands the area became a popular resort destination in the late 1800s and early 1900s. Some of those resorts, like Stewart Mineral Springs, still stand today, while only remnants of others remain. Much of the area’s popularity has been tied also to mountaineering and snow sports. John Muir traveled to the area in 1875 and was trapped high on the mountain by a snowstorm. He and other climbers huddled in hot springs for 17 hours to survive the storm. Muir was one of many noted writers, artists, botanists and other scientists who traveled to the mountain. The College of the Siskiyous’ Mount Shasta Collection preserves much of the body of work inspired by the towering peak that has been shaped over the past 250,000 years by a series of four eruptive episodes. Mount Shasta has long been home to mountaineers and other backcountry enthusiasts. The first recorded climb to the summit was in 1854; today over 10,000 people make an attempt on the summit annually. Those interested in less wild terrain downhill and cross county ski at the Mt. Shasta Board and Ski Park, which opened in 1985 below tree line. 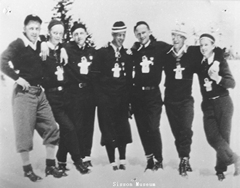 In the 1930’s Snowman’s Hill, on the road to the Park, was the popular spot for skiing and ski jumping. For two decades a ski area was maintained above tree line at the end of Everitt Memorial Highway. A fire destroyed the lodge in 1971. The lodge was rebuilt and the Mt. Shasta Ski Bowl remained open until a 1978 avalanche took out the upper ski lift. Alongside the recreation inspired by the spectacular setting, the community’s economic base was built on the timber industry, government agencies, education and a variety of small town businesses. In recent years the medical community grew to be a large part of the community’s economy. The role of water strengthened in the late 1990s when a water bottling plant opened in Mt. Shasta City. The inclusion of this clean industry to the area’s economic base reflects residents’ desires to preserve the natural beauty of this place and the special quality of life that comes from living on the slopes of this mountain.